Testimonials  what students are saying about Easy Hebrew"
Easy Hebrew is a Hebrew language course for Christians / Messianic Believers who long for spiritual insight into the Bible and a working knowledge of Hebrew, instead of dry difficult academia. Why Study Hebrew With Us? Easy Hebrew was created specifically for you, the Christian or Messianic Believer who longs to understand not only the Hebrew language, but also the mindset of the Bible and the people. With us you are spiritually enriched while learning this spiritual language. Easy Hebrew is serious Hebrew, simplified. Here is an enjoyable, inspiring way to learn the Hebrew language well  No dry, difficult academia yet comprehensive and practical. Does not leave you at kindergarten level. Easy Hebrew is not merely a course; it is a personalized program. You are not left to struggle with the lessons on your own. We take a real interest in each student. Our goal is to teach you, not just sell a course. Easy Hebrew is the only Hebrew language program that promotes spiritual insight into the Scriptures and a good working knowledge of spoken Hebrew at the same time. 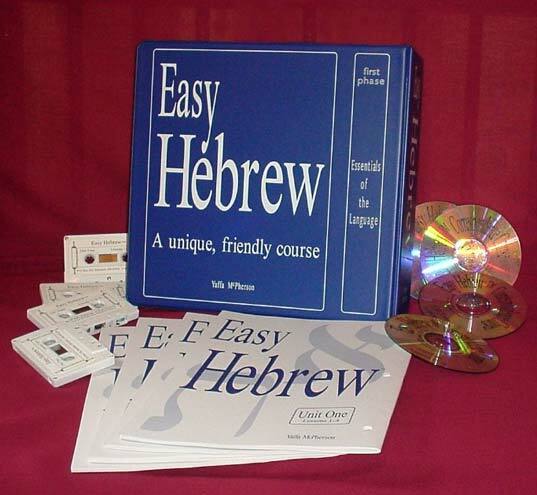 Easy Hebrew is a revolutionary, refreshing and time-tested Hebraic roots approach to learning Hebrew. Through Modern Hebrew, from the alphabet, to the vocabulary and grammar, the spiritual "mindset gems" instill usable language skills while leaving the student spiritually informed and uplifted. Isn't that why you have longed to know Hebrew in the first place? How can both Modern and "Biblical Hebrew" be learned in the same course? Take it from one whose native tongue is Hebrew. First of all, many courses available today teach the alphabet poorly, with no instruction for proper alphabet letter formation. Secondly, they give you no ways to help with spelling. Thirdly, there is no such thing as purely "Biblical Hebrew." Because of the term "Biblical Hebrew," Christians are confused about whether there is a difference between Modern Hebrew and the Hebrew of the Bible. Due to the great difference between modern and classical Greek, most people do not realize that Hebrew has changed very little comparatively since Bible times. It's a miracle! At least three quarters of the Bible's vocabulary and grammar are the same as that of Modern Hebrew. Hence the term "Biblical Hebrew" falsely leads a student to believe that the Bible's Hebrew can somehow be isolated or cut off from Modern Hebrew. How will you get to your destination, the Scriptures, if someone cuts off the bridge? Today's spoken and written Hebrew, taught correctly, is that bridge. The truth is, courses labeled "Biblical Hebrew" are not truly void of Modern Hebrew. What they are void of, ironically, is the Spirit with which the Bible was written! In today's "Biblical Hebrew" courses, the rich, spiritual Hebrew mindset is all but ignored, replaced by grueling academia. The pastor or seminary student who already "endured" the dryness of "Biblical Hebrew" rarely acquires the ability to accurately use Hebrew, or to apply the Hebraic mindset. On the other hand, courses which are strictly "spoken" or "Modern" Hebrew, even those offered by Israelis, also lack the spiritual mindset of the language and of the Bible from the Hebraic roots perspective. Therefore, they are not suitable or sufficient for Believers, Messianic or Christian. Where is a Believer to turn? In taking Easy Hebrew Correspondence Course you avoid the futility in spending time and effort on the inadequate, short-cut, poorly conceived courses that are available today. This is an entirely different kind of course. Doing justice to this unique, God-given language, Easy Hebrew compares to no other! Take it from an Israeli Believer. You will not find a more genuine Hebrew language course! Easy Hebrew is not only spiritually oriented, the course is broken down into small, workable, easy to understand increments. All grammar is well explained in sensible, plain English. Other courses teach you strictly narrative Hebrew (because it is easier to understand), concentrating on a single part of a book of the Bible such as Genesis or Ruth. Without the skills to recognize the contrast between the narrative and the poetic, we cannot appreciate the beauty and intensity so ingeniously expressed in the Scriptures. Neither can we distinguish figurative intent from literal. Easy Hebrew  broadens your understanding and gives you the tools to comprehend the styles of the Psalms, Proverbs and Prophets as well. Without certain word-order skills and the like, you have very limited knowledge or skill to formulate your own sentences. Without this all you have is dead-end grammar, no matter how many words you know. With Easy Hebrew, eventually you begin to read with a "Hebraic eye," not mechanically or by guessing, so you can distinguish figurative language from literal. Therefore, you understand much of the Bible's intended message. Easy Hebrew is the only course that teaches you to read the message, not just the words. "Biblical Hebrew" courses coldly dole out grueling grammar charts and lessons containing rule-after-rule for memorization. Easy Hebrew introduces them a little at a time and gives you "rhyme and reason" for their uses. "Biblical Hebrew" courses keep you far removed from real life and are too stark to promote retention of material. Easy Hebrew uses living Hebrew. Delightful, original reading lessons balance enriching insight into many Bible passages. Both the language and the Bible come to life! You actually enjoy learning Hebrew, and are glad that you learned it. Retention, not only memorization, is our goal. Throughout the lessons of the course, you are given memorization "tricks" and other creative learning tips. In addition to learning superior reading and pronunciation skills, Easy Hebrew  teaches you Hebrew script. (Script is the flowing [but not connected] handwriting form, roughly equivalent to English cursive writing.) No one literate in Hebrew "prints" text characters; they only read them. With Easy Hebrew you learn to both read and write accurately, as well as to conduct spiritual research in the Bible. Sounds difficult? You will be amazed and pleased with how quickly and easily you will begin to read and write with Easy Hebrew's unique, inspiring teaching method. You will also be inspired by insights into the mindset of the Bible, and the study of selected Scripture readings. The author of Easy Hebrew believes that learning Hebrew should be an enriching adventure. That is exactly what you will experience with Easy Hebrew Correspondence Course. If you take Hebrew, take it from an Israeli Believer. Each Phase is roughly equivalent to a college semester. In a unique, enjoyable but thorough correspondence form, your instructor encourages you and gives you personalized study tips. A structured but flexible study pace allows completion of each phase in six months or up to twelve months. Extensions also available. The First Phase, Essentials of the Language, will give you a working vocabulary of well over 500 Hebrew words. You will learn to accurately read Hebrew text and write Hebrew script, and speak conversational Hebrew the way Israelis speak it. At the same time you will acquire mindset keys to understanding the Scriptures and its Hebraic symbolism  such lessons are found nowhere else! The First Phase focuses on the basics of the language, while introducing the Hebraic mindset of the Bible. It is sprinkled with rich word studies and the spiritual significance of key words. This not only teaches you Hebrew, but also endears the language to your heart. After completing the First Phase you will want to continue in the Second Phase, Exploring the Mindset. In this Second Phase you will gain another 500 (plus) words, learning to apply the essentials of Hebrew that you learned in the First Phase. You will thus explore the mindset and delve even deeper into the mindset of the Scriptures as well as of the people, achieving speaking fluency and gaining pronunciation clues. Whether you are Christian or Messianic, the further you are in this course, the more you will appreciate your Hebraic roots. Order by check, credit card, or PayPal. Includes all First Phase course materials, audio portion on audio CDs and up to a year of access to the instructor (study-time extensions available). Canada and Mexico  add $45. Any other countries  add $90. New Mexico residents: add 8% sales tax. Family Discount: $35 discount (for First Phase) for each additional family member living at the same address and taking the course concurrently. Send us an email for a price quote. Please make sure to include the number of students you wish to enroll. Course materials are shipped via the postal service. Prices are in U.S. dollars and are subject to change without notice. If you have further questions, please feel free to e-mail, call or write. Be assured that we NEVER sell or provide your contact information (including email address) to others, or inundate you with unsolicited advertising. God's Prickly Pear  the author of Easy Hebrew has written of her growing up years in Israel and beyond  a story of endurance and triumph over adversity. Inspiring! Intimate Awe Ministries  Home Page: We write, publish and speak from the Hebraic perspective with a no-nonsense approach to our walk with God. Copyright ©2017 by I.A. Publications of this page and all contents, graphics included.